…. since we launched the AGCommons website a couple of months ago. Quite amazing interest in how geospatial technology can help agriculture! Visit the site to learn about our new program! Presentation 2: 2 speakers, 10 min total, plus a 2 min video “Why women matter”, 20 min discussion. Comment I received from the presenters: they felt that the time suggested for presenting their sessions was too short for the audience to understand enough about the subject to then ask in-depth questions. 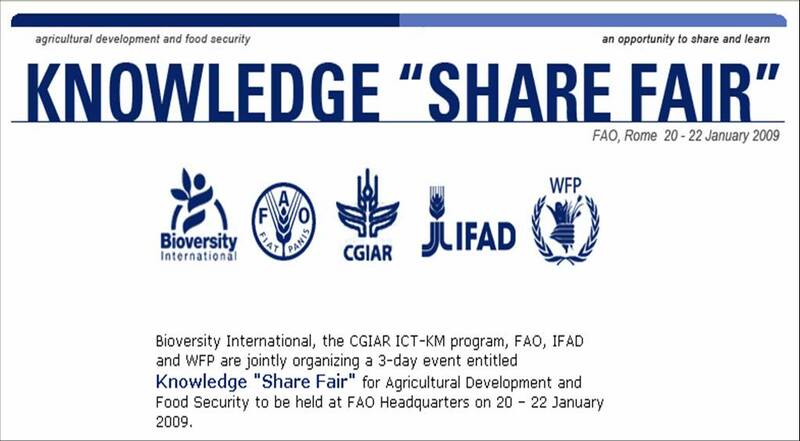 Bioversity International, the CGIAR ICT-KM program, FAO, IFAD and WFP are jointly organizing a 3-day event entitled Knowledge “Share Fair” for Agricultural Development and Food Security to be held at FAO Headquarters on 20 – 22 January 2009.
develop ideas to support and enhance knowledge sharing within and across our organizations. The purpose of the event is to showcase examples of good knowledge sharing practices in the field of agricultural development and food security. Specifically, we have structured the Fair to allow staff to learn from each other how knowledge sharing practices, methods and tools have enhanced their work and made their project(s) more successful and effective. The Share Fair will showcase examples of knowledge sharing strategies, policies and operational practices using case studies, anecdotes, and face-to-face events. We would like you to tell us a story about how you and/or your project dealt with one – or more – of the contexts (see Section 2 and 3 of the Call for Proposals).